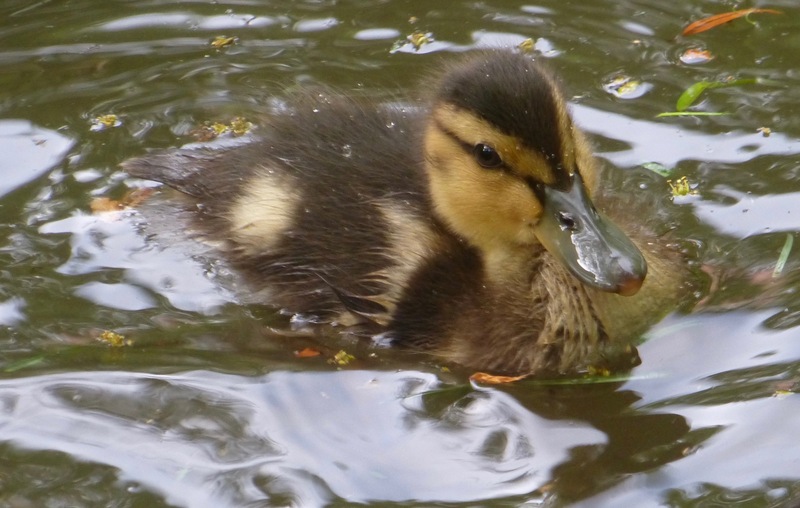 All the ducks are fine, and the “ducklings” must be very close to fledging, as their wings are large and have plenty of flight feathers. Honey is still molting, and has gone off her feed, eating only mealworms and corn and spurning the duckling chow. A birder friend tells me that this is typical during a molt. I had a bit of a duck trauma the last several days. 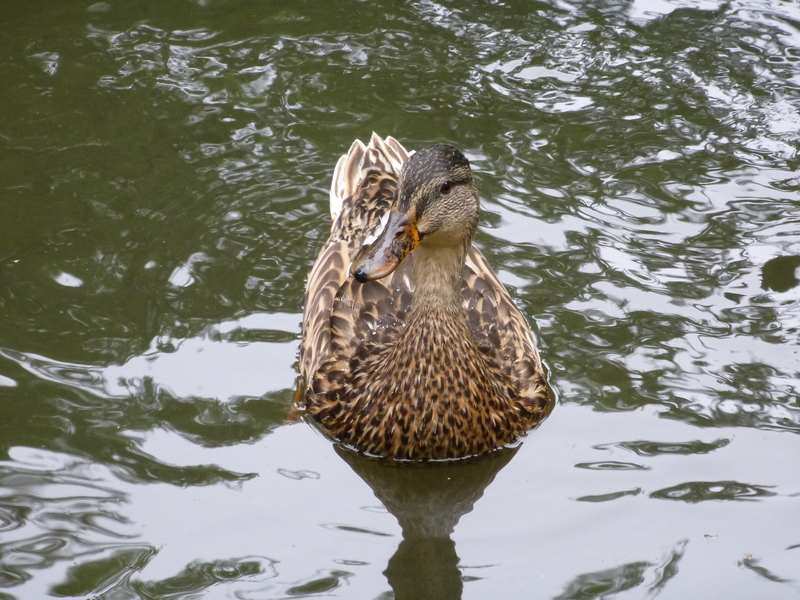 One of the ducklings was chased by the others repeatedly, and several times I saw her sitting by herself with her head tucked by her side. Here’s an example from yesterday morning. See her at the rear, resting while the others are foraging on the lawn? And look how big the ducklings are! They are now full-sized ducks. Look at this poor baby! 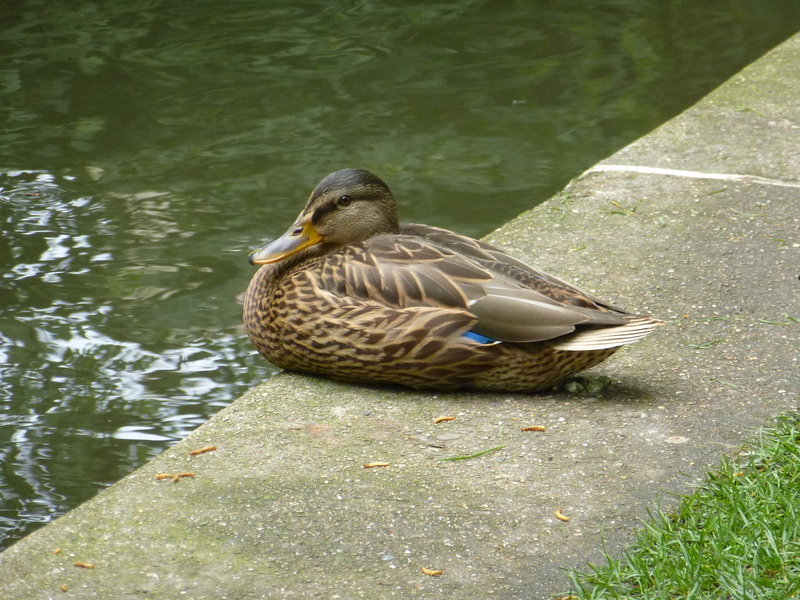 When I approached her she didn’t move, but got alert, and I didn’t want to disturb her lest she needed her rest (I think it’s a female because it quacks). But the good news is that she’s joined the pack again and is eating well and cavorting with the others. I wonder if she’d been chased so much that she withdrew. I’ll never know, but I’m delighted that she seems in good shape now. 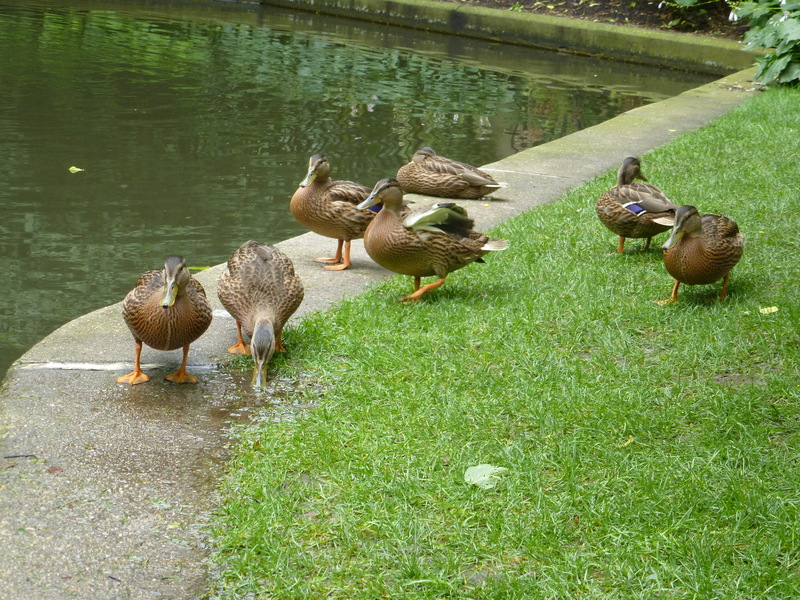 Ducks having lunch today. 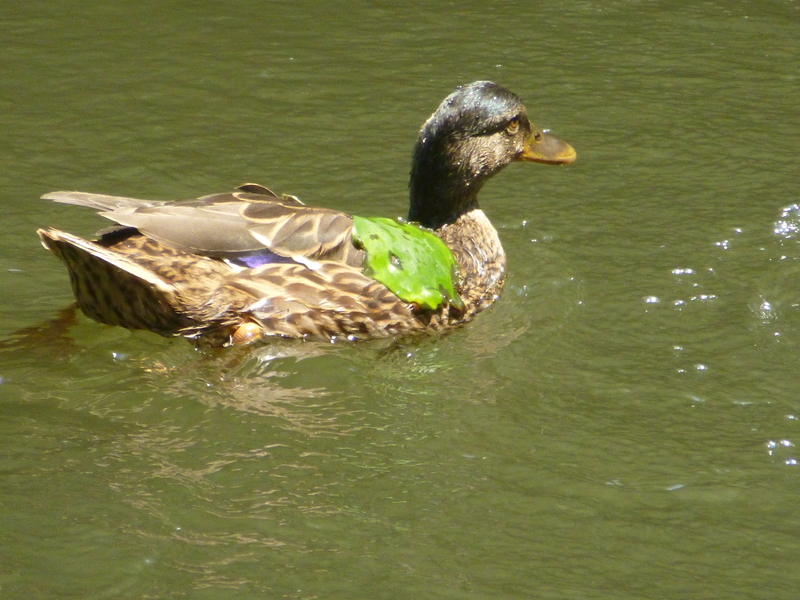 Look at that crazy duckling with a leaf on its back. Honey is in the rear. This entry was written by whyevolutionistrue and posted on July 23, 2018 at 2:30 pm and filed under ducklings, ducks. Bookmark the permalink. Follow any comments here with the RSS feed for this post. Both comments and trackbacks are currently closed. 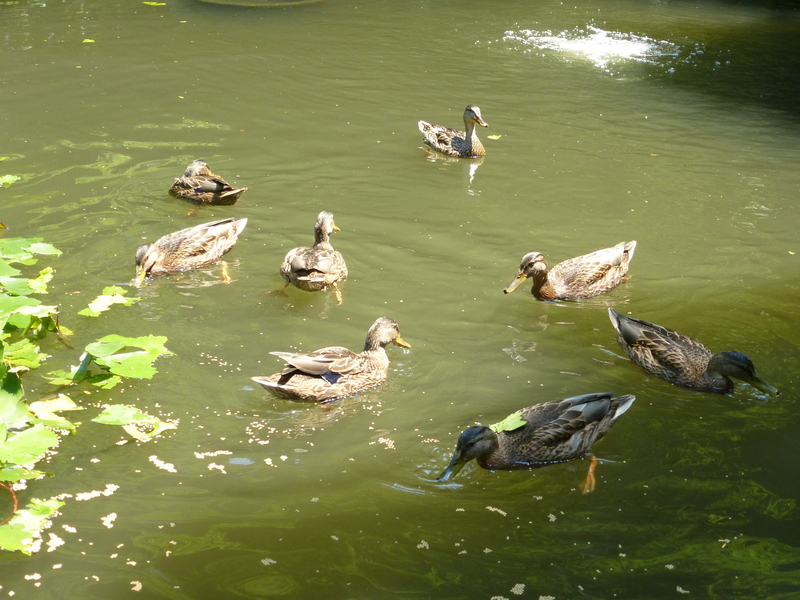 When is the publishing date for The Story of Honey and Her Ducklings- with many photographs? Hereis my request for a first edition. Do we know your non-feathered “best girl” among commenters here prof? Or did you meet her in one of the usual ways e.g. while walking a duck, squeezing an avocado at Wholefoods etc. You’re gonna need a bigger bathtub. I guess they can kinda move fast when they want to. Opossum vs. dog. What a great post, I love seeing the progression of the ducks. What are some tips you have for getting good photos like this? I don’t think they qualify as ducklings anymore. In the Spot the Duck picture, can readers spot the 5th turtle? That one is a bit more challenging! There are TWO ducks in the picture. 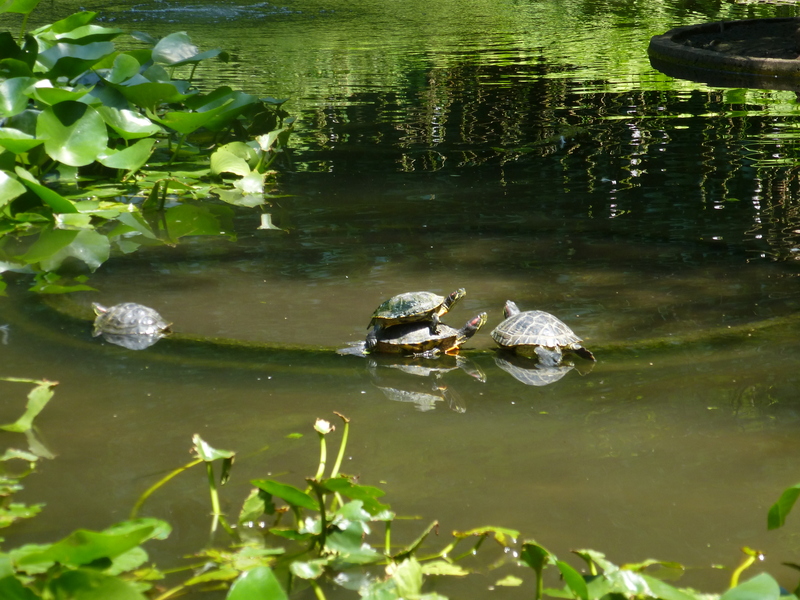 One looking at camera sitting in the water, in the gloom at very top of frame behind the turtles. I will now look for your fifth Beatle turtle. 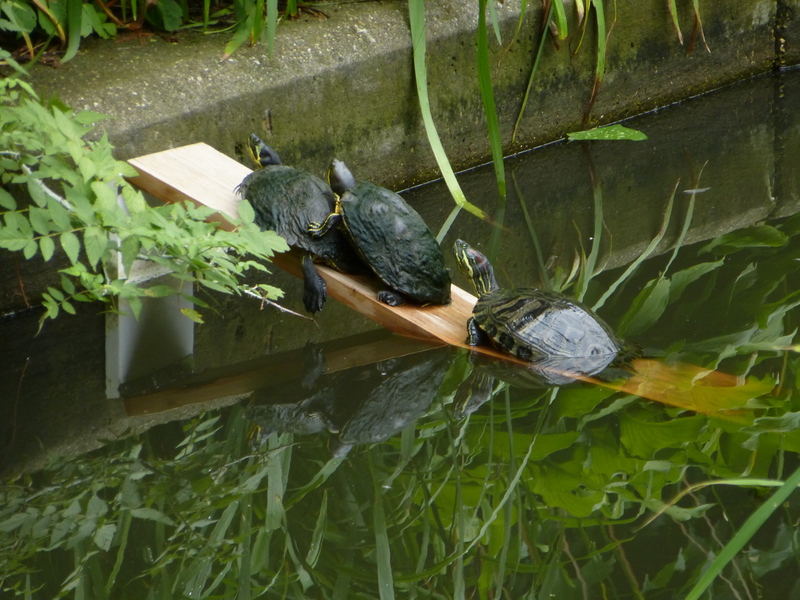 There might be a fifth turtle beneath the right-most turtle, but I’m not sure it’s another turtle. 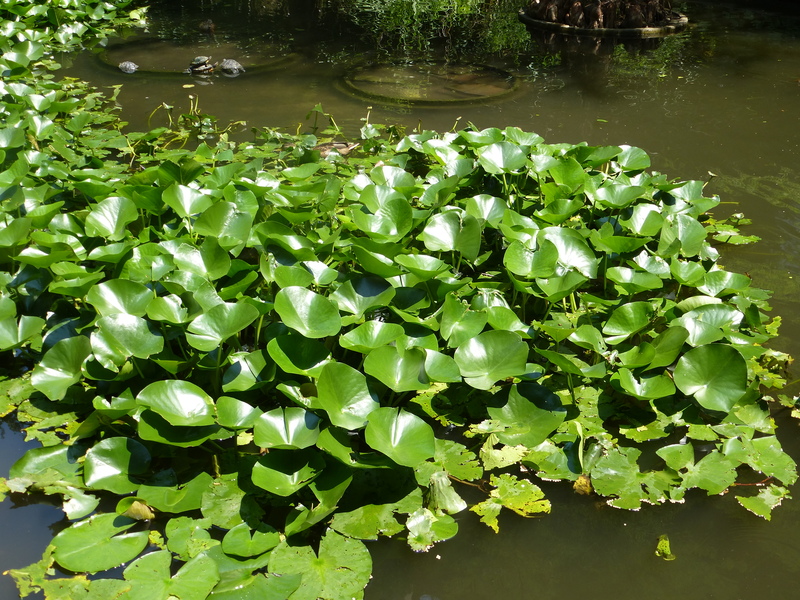 There is what appears to be a turtle head poking up through the lilies almost in line with the hidden duck, and off to the left of it a way. But I can’t see it clearly enough to be 100% certain it’s a turtle. 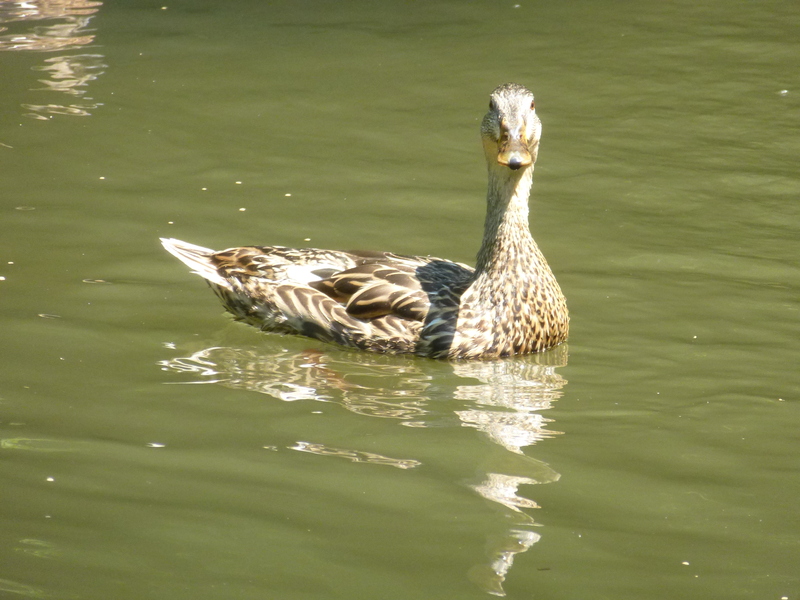 The duck that was being chased was probably not feeling well. I’m not conversant with bird diseases, but I know a lot about herd/flock behavior. When one of a group is unwell, the others pick on him/her because an ill herdmate/flockmate can slow the group down and make all of them more vulnerable to predators. It seems cruel, but it’s a survival mechanism. Since she’s now feeling better and has rejoined the flock, the aggression will stop. Many times whatever is making them ill is fatal, but there are also many survivors, too. i’m glad she’s OK; and perhaps she’ll have some residual immunity from whatever it was. The leaf is intentional. It’s a duckoration. I find the growth rate simply astonishing. Makes me think about growth rates of dinosaurs, especially sauropods. I now understand when scientists say they got big quite fast. Yep, just eight weeks after hatching the young apatosaurs flew off on their own. Since ducks *are* dinosaurs, you’re experiencing it first hand (or at least vicariously first hand)!